I often like to cook up a pot of lentils (pulses) and make a nice cold salad as an appetizer tray or as individual salads. 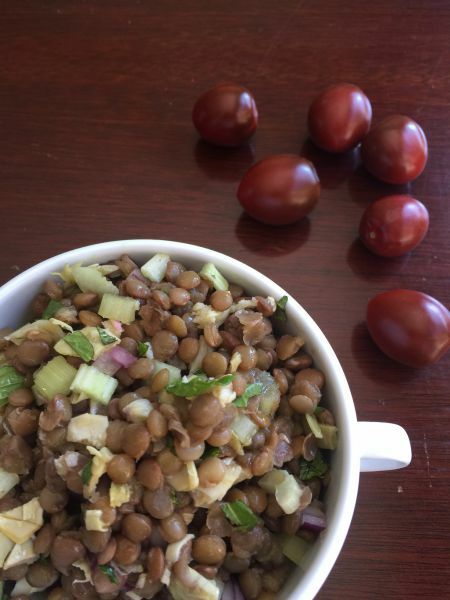 Grape or Cherry tomatoes can be found year around in most places and make a nice companion to the lentils. Lentils are so versatile that you can make this up in minutes by adding whatever you have on hand in your refrigerator. Add cucumber, avocado, green onions, nuts, or beans for a complete meal. Lentils are a staple in the Mediterranean Diet, and one of the top 10 ingredients in a Greek Diet. They are often called pulses, which also include beans and peas. Defined as a dried seed that comes from many legume varietals. Not seen often in the American diet, but slowly they are making there way into the cuisine. They are the super food for many people who do not consume meat, often called “poor man’s meat”. As you can see lentils come in many varieties and flavors. Here is a nice online selection from Bob’s Red Mill. Here are a few nutritional facts about the powerful lentil. Stored in airtight container they can last in your pantry for 6-9 months. Rich in nutrients, high in protein, with vitamin B and C, iron, and fiber. They have a low carbon footprint and enrich the soil where they are grown. They are also a water-efficient source of protein. More information can be found at the GPS site Global Pulse Confederation. Also, check the Pulses.org. for more information on these wonderful super foods. This powerhouse lentil salad can be made ahead and assembled later in the day. The lentils can be prepared several days ahead. I used grape tomatoes but any small tomato or regular tomato can be substituted for a side dish. Just double the recipe for larger tomatoes. In a medium saucepan fill with water add the lentils. Bring to a boil and reduce to a simmer for 20-40 minutes. Drain and set aside in a medium bowl. Cool. Combine the lentils, artichokes, celery,onion, parsley and mint. Add the oil, vinegar, zest, salt and pepper. Gently mix. Make two slits into the tomato, (being careful not to reach the bottom) and gently spread with your fingers, and add filling. Served chilled on a platter or as a salad on individual plates. Make this salad for a large crowd days ahead and dress at the last moment. © 2016, Mary Papoulias-Platis. All rights reserved. Yum! Looks beautiful and sounds delicious! 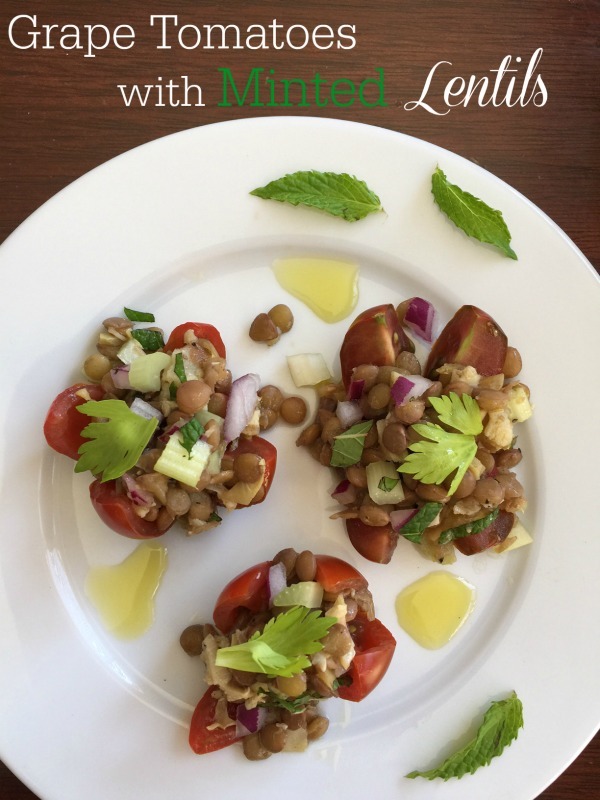 I especially like the artichokes hearts in with the lentils and the sparkle of fresh mint. Thanks! Am I a dork for thinking, “Wow, she’s hollowing out and stuffing each and every little tomato? That’s some dedication!”? LOL But this works too…and look yummy! No no! Just cutting in fourths and not reaching the bottom and fanning them out! Haha! Just a quick appetizers to throw together and one that is healthful to all!